No concrete is required with the GN bracketed towers. Designed to be spiked into ground with Galvanized steel drive stakes. Light and easy to assemble. Note: All sections complete with necessary nuts and bolts. Top sections include top bearing set screw and lower mast clamp assembly. 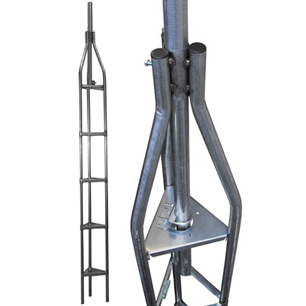 • Each section subjected to pressure testing to ensure all weld points pass the minimum strength requirements The result is a safe and reliable tower - look for dimple on braces. 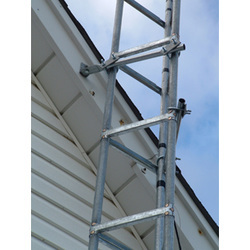 ​Designed to support equipment up to 3 square ft. (0.28 m2) projected wind area, mounted not more than 2 sections above house bracket. Caution: Guy wires must be used for larger loads or greater heights above house bracket. However, the towers have not been tested to CSA standardsCSA-S16 and CSA- S37-13 for loading larger than what is indicated above. 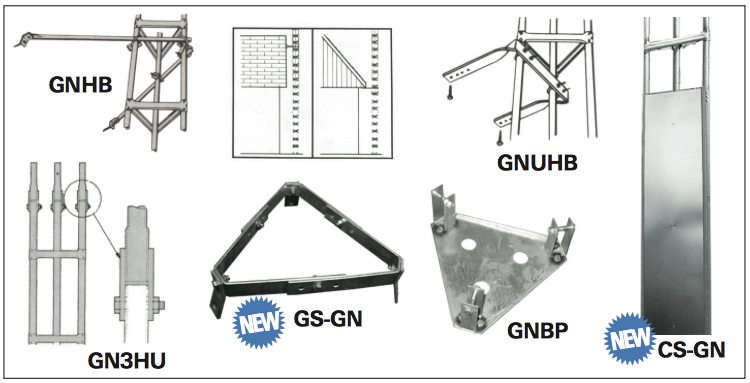 Our Entry Golden Nugget Package includes everything needed to install a 40' tower. The mast will add 4-8 foot to the height, thus true height is 44-48ft. Our Entry package is sold at 30ft or 40ft. A normal one story house may be 18ft above ground. Normally they recommend 2 or so sections (20ft) above the peek. In the case of a DMX bracketed tower they allow 2.5 sections above the peak (25ft). That would normally mean a 38ft-43ft tower at most. A two story house may be 28ft above ground thus easily allowing a 40ft tower. Use your own judgement whether your intall will support a 30ft or 40ft tower. Height also may be extended if you use guy wires or are in a sheltered area. DMBS Galvanized steel drive stakes. Set of three. 1 1⁄4” (3.2 cm) x 3’ (0.91 m). Universal house bracket 1” O.D. (2.54 cm) x 3’ (0.91 m) arms. Climb Shield for GN Tower.